The ones in red remind me of Bobo! You know what is a "diet", don't you? It's "die" with a "t," that's what it is! Love me, feed me, never leave me. All I do is eat and sleep. Eat and sleep. Eat and sleep. There must be more to a cat's life than that. But I hope not. Anybody can exercise... But this kind of lethargy takes real discipline. Avoid fruits and nuts: after all, you are what you eat. Eat every meal as though it were your last. I am hungry. Therefore I am. I shall now attempt to eat a diet lunch consisting of one leaf of lettuce lightly seasoned with ... one quart of Mayonnaise ! Oh no! I overslept ! I'm late ! For my nap. This is it. I've reached the pinnacle of laziness and gluttony... How depressing. There's no place to go after you've reached the top. With due respect to Will Rogers, I never met a lasagna I didn't like. Would you be willing to lead a parade in celebration of the lazy life? If the answer is yes... you're all wrong for lazy week. You can bet it wasn't an exercise freak who invented power steering. You can scratch my chair, you can insult my mother, you can beat up my dog, and you can play with my rubber mousie... but you don't eat my food and you don't sleep in my bed. I had to stop and let you know that I love love love your blog! 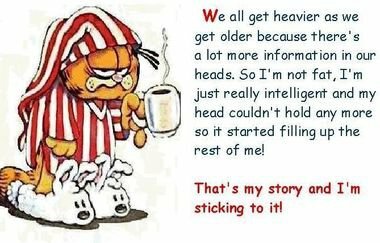 You have so many different interesting thoughts and quotes, and I love the Garfield cartoon especially! I would appreciate if you would check out my blog too insh'Allah. http://veiledcouture.blogspot.com. Thank you!